Tired of your various Mac apps winding up in the wrong virtual desktop? I know the feeling. Well, good news. You can, in fact, assign an app to a specific desktop in Mission Control—perfect for keeping your programs in their proper “spaces,” particularly when you’re booting up your Mac. Before we begin, something to keep in mind: this trick applies only to apps running in standard “windowed” mode. 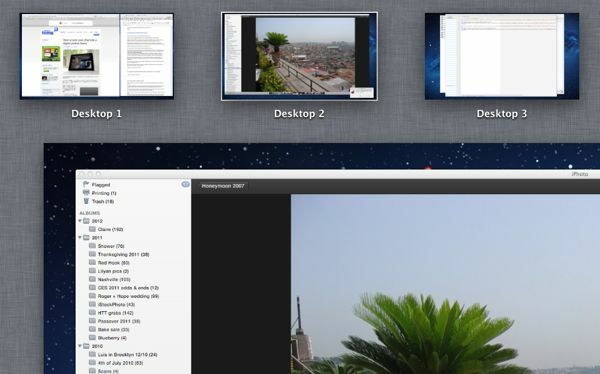 Programs running in “full screen” (a handy new feature in Mac OS X “Lion”) automatically get assigned to their own desktops. 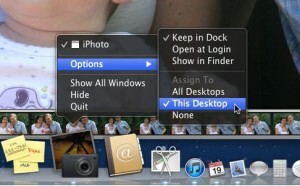 Just select “This Desktop” to pin an app to a specific Mission Control desktop. First, navigate to the desktop where you’d like a particular program to call home. If, for example, you want iPhone to sit in Desktop 2, launch Mission Control, then click on Desktop 2 from the overhead Mission Control view (or create a second desktop if there isn’t one already). Launch the app you want to assign to the desktop—again, let’s use iPhoto as our example. Go down to the Mac desktop dock at the bottom of the screen, find the icon for iPhoto, and right-click it. In the menu that appears, select Options, then select “This Desktop” under the “Assign to” heading.